Even before the party started, our Bavarian trek was proving worthwhile. Few mountain ascents feature hot sausages and cold beer in a comfortable cabin, but my brother and I ordered just that on one of Germany’s highest peaks. Grey clouds, cold rain and even early autumn snow tested our resolve, though Dan and I hiked two hours to reach the beautiful and rustic Watzmannhaus at 6,330 feet anyway, hoping conditions the following morning would permit us to reach the 8,695-foot summit of Watzmann in Berchtesgaden National Park. 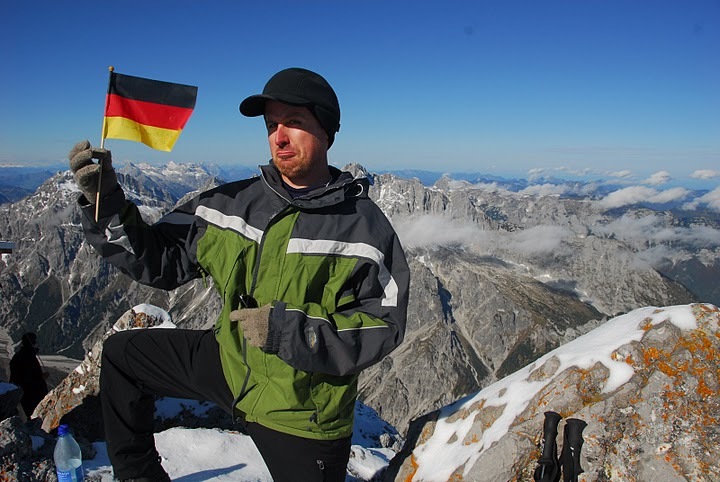 While I’ve visited Germany many times and climbed in America for years, I had never fulfilled my dream to climb in the German Alps. As we settled in for the evening, we could see that others shared that same ambition. While darkness fell, the lodge filled with about 20 men, women and children, all of them Germans and friendly enough to overlook my less-than-perfect command of their native tongue. That’s when things got interesting. Into the dining hall marched three portly German musicians in Bavarian hats, plaid shirts, vests and lederhosen, playing a harpsichord, a trombone and a clarinet. Songs, games and laughter filled the next several hours. To get swept away in the revelry would have been easy, but we knew better than to challenge a room full of Germans to their own beer drinking games. Besides, we had a mountain to climb, so we retired at a reasonable hour to our small room and bunk bed in anticipation the next day’s summit push. An interesting legend explains the creation of Watzmann and other Berchtesgaden peaks. An evil King Watzmann ruled the region once upon a time, according to the fable. He and his cruel wife and children tortured and killed both animals and people, but they went too far when they turned their vicious dogs on an innocent farmer’s family. A dying grandmother cursed them, and Watzmann and his relatives were turned into mountains. So today, locals encourage hikers to kick the wicked royalty with their shoes while walking on their bodies. Not that Watzmann is the only attraction of Berchtesgaden. Hikers can trek to their heart’s content on thousands of miles of scenic trails, and the experience is rather different than backpackers experience in America. Camping is “verboten,” but 26 “Alpenhütte” (mountain huts) offer food and shelter at reasonable prices. So overnighters not only carry less weight on their backs, they are also more likely to eat weinerschnitzel and potato salad than dehydrated oatmeal. Königsee is the park’s other can’t-miss attraction. This spectacular emerald lake, five miles long, resembles a fjord in the way it meanders through a mountain canyon. On a boat tour, visitors will see such sights as the St. Bartholomä palace and chapel, once the vacation home of Bavarian kings. Those who get off the boat and walk a ways are rewarded with waterfalls, the Eiskapelle ice domes, and the chance to buy fresh milk from dairy farmers. The nearby town of Berchtesgaden offers tours of its historic salt mine Salzbergwerk, more than four centuries old. Visitors don overalls and ride small trains through narrow, brick-lined tunnels, plummeting down wooden slides to descend into the depths of the mine. A highlight is boating across a remarkably clear underground lake about 100 meters long. And no trip to the area would be complete without a stop at the Kehlsteinhaus, a mountain lodge more popularly known as the Eagle’s Nest and once the property of Adolf Hitler. The Nazi Party made a gift of the building and grounds to their Fürher in 1939, even tunneling deep into the mountain to build an elevator so he could ride to the top in comfort rather than trudge to the 6,017-foot high summit of Kehlstein. Ironically, Hitler suffered from vertigo and rarely visited the retreat that 3,000 workers labored to build. Today a charitable trust operates a restaurant in the Eagle’s Nest. The food is good, and the views are better. A trail from the back deck leads hikers on an enjoyable loop through hills and boulders, taking about an hour to complete. Climbing Watzmann was our main attraction, however. Clear skies greeted us in the morning at Watzmannhaus, and the ascent was on. While the prospect of ice had concerned us, the sun softened the slopes and we were able to climb the final 2,365 feet without crampons or ice axes. This was a good thing, since we didn’t have these items with us. Painted rocks marked the route and steps and cables protected steep sections. When we reached the summit two hours later, perfect visibility permitted us to see hundreds of snow-capped Alpen peaks. A dozen smiling climbers shared their chocolate, salami and brandy. “Vielen Dank!” I said, thanking them. While we enjoyed the moment, we were amazed to hear a horn echoing through the thin air. A trumpet-playing hutmeister from the Watzmannhaus was offering us a musical salute, a Bavarian tradition. A few climbers roped up to ascend the nearby summits of Südspitze and Mittelspitze. We were tempted to join then, but the heavy snow and steep terrain required harnesses and gear to traverse. To bag these peaks, we’ll have to return better equipped. Instead, we descended to a lunch of hot soup and bread at the Watzmannhaus, grateful for the adventure and for a reason to come back to Berchtesgaden again. If there’s any place to experience both Germany’s culture and mountain scenery, this is it. Getting there: Berchtesgaden is about three hours away from Munich by train. Passengers must transfer at the Freilassing station. Bavarian rail offers a great deal for groups traveling within Bavaria: up to five passengers can ride throughout the state for a day on a single ticket for only 27 Euros. Accommodations: In the town of Berchtesgaden, try the Hotel Floriani, which is just a short walk from the main train station. This family-run bed and breakfast offers comfortable rooms, good prices and very friendly service. Read more at www.hotel-floriani.de/. Salzbergwerk: The mine is within walking distance of Berchtesgaden’s main train station. Tours are offered daily. Tickets cost 14 Euros for adults and 9 Euros for children up to 16 years old. For more information, go to www.salzzeitreise.de/ and look for the English link on the top right corner of the home page.